Last December (2014) I got this strange bug / dream to run Western States 100. It was not like the same day conversion, but as a result of it, I started to run more with ultra people, ran back and forth to my nearby Mt Diablo (4000 ft of elevation) almost every other week, registered for WS 100 qualifier 100K race in May and basically put my road racing on a back shelf. Actually not true, but for some reason I expected my ultra training with extreme hills will not be so much detrimental to my road race results. Unfortunately, I got really sick this past January, was not able to run much, then I got sick again and then again and basically was able to only average about 40 miles per week for the first half of the year. I still managed to run two decent but nothing to brag about marathons – Napa and Boston (barely cut sub 3s in both of them) , ran WS 100 qualifier race (Quicksilver 100K) and even ran 70 mi in 3 days at WS 100 Training Camp in May and 6 hours race in San Francisco in June. I hurt my right(?) knee during training camp and I screwed my left ( ) knee during 6 hours race. All that running was awesome from fun point of view but it was definitely telling me my fitness slowly but surely is deteriorating. So, after 6 hours race in June, with some help of conviction from sub 2:50 thread people, I decided to concentrate my effort on road racing again and train for CIM in December. I didn’t have so many weeks until my goal race for a very long time, so, I was really curious how that plays out. For the race I had a goal of getting a Moose Mug trophy – it’s an award created by one of the old timers from RT forums (pre RWOL times), rbbmoose – basically, to get it, you need to run faster than 2 hours plus your age. It is definitely one big and challenging task – in my case that meant I really need to run sub 2:50, but that goal is so freakingly motivating for many of us. So, I decided on 12 weeks plan from the latest book from Pfitzinger and chose the most challenging plan there – 81-100 HM 4. Yes, the plan says it’s for Half Marathon preparation but for me, there was nothing really specific about HM there – I liked the way the plan was structured, I liked all the workouts there and the only part I changed a little – I added 3-4 miles to plan’s long runs, that made the plan to be more like 85-105. Because I had more time than 12 weeks before the race, I started to base building in July, going from 40-45 miles a week to over 100 miles in September. It was not too steep ramp up for me – because I already ran 100 miles weeks before and base building meant I didn’t have quality workouts, so – it was relatively easy. At the end of my base building cycle I raced 10K in 37:55 (6:07 pace). Then the formal training part started and it was all familiar routine – basically plan had two quality workouts per week – most of the time, one LT workout on Wednesday and one LR with quality elements on Sunday. Wednesday’s workout always scared me – its intensity and the pain was making me feel really anxious the night before and the morning of the workout. But either I chose the paces wisely or something else, almost all those workouts were quite successful. For long runs I also changed my regular way of executing them – I used to approach them as long steady runs with average pace of MP + 15% (MP+20% for first half, MP+10% for the second). But this time I was going to make them somehow harder – most of the weeks I had some different intensity elements during LR – either 3x3mi @ MP, or a progressive run with a finish at LT pace or 16 miles at MP+5% and for the less intensive LRs I always tried to run last 2-3 miles at MP or faster. That probably sounds nothing special for many of you, but it was quite a change in my training. Last 4 weeks of the training were also kind of non-typical for me – 4 weeks away I ran 10K time trial (6:03 pace), 3 weeks out I ran a tune up HM – 1:21:44 (6:13 pace and two and a half minutes PR) and then 2 weeks out I ran 15K race (6:06 pace). Those three fast efforts definitely showed me I was in best shape of my life – especially encouraging was HM PR because I could not break 1:24 for almost two years before that. Definitely, the training plan was working. Still, aggressive McMillan running calculator was only predicting 2:52 for my marathon, but I knew myself – I ran 2:50:56 before with 1:24:20 HM PR and was thinking that with newer, faster half time I definitely have a shot on running sub 2:50. Last few days before the race were worrisome – my legs felt like they had a flu, my colleagues in the office were sneezing and coughing all over the place and my 1 year old at home didn’t have good time either with his sleep (or I would say – no sleep) pattern and was not giving us good sleeping time either – he has a pretty intensive teething fever. In some desperation I ran Sweat Run (or Heat Run) – a run in some sense invented by our forumite kayry that did wonders for him (basically you run for an hour in all warm clothes you can find and trying to sweat a lot and get your HR up to the Marathon effort number) . Have no idea if that helped or not, but absolutely know that what helped is that my wife allowed me to sleep in our garage (that was not a punishment – it was the only place where I would not hear my little one during the night) for the last two nights – so, I was not bothered by our little one’s issues and had the most amazing recovering two sleep nights. We went to Sacramento with my daughter – my wife stayed at home with our little one – we decided that it would not be the greatest idea to be in the same room during pre-race night – little kids turned out to be such a complication . But my wife is definitely my hero! Everything about pre-race day was uneventful and nice – check in to the hotel a block away from the finish, 5pm dinner with kayry and few members from our running club, getting back into the hotel and having a nice sleep from 9pm till 3:50 am. The weather was also not planning to do any tricks on us for the race day – the only our concern was – will we have a rain during the race or not. Other than that – 47 oF, no sun, no wind – what else could you wish for? Race buses drove us to Folsom by 5:50am, I had enough time to go to a porta-potty, walk and do something reminding a meditation , then one more porta-potty visit (just in case) and I was at the start line by 6:55pm (it is 8,000 peoples race but I was able to get near the first lines without any problems). There were also many fast runners for this race – it was one of the last marathons where fast runners tried to get their best times to run Olympic Qualifier Marathon in February – there were so many freaking fast women there btw, just unbelievable. Right around 5 minutes before the race some noticeable rain started, but it was not really heavy and the rain was not cold. And without a strong wind it is really not a big issue at all – some may even say it’s a welcoming cooling. Anyway, after the Anthem the race started on time – 7 am. The plan was just a usual – run first 2 miles conservatively, not just time wise, but effort wise – because first mile is the biggest downhill mile of the race. Looking back I always surprised how first two miles are real indicators how things going to work out – in this case it was really fun to run downhill, really easy and still be able to pace 6:29. Mile 2nd starts with some uphill section and it’s another interesting part about running CIM – CIM is a rolling hills course, you have to be able to judge your running effort at some places, the hills are not real high hills but they slow you down enough to notice that on your GPS watch. Anyway – mile second – another 6:29 mile. My plan for the race was trying to keep 6:25 pace for as long as I can and just trying to hang on to that at the end. So, when mile 3 started and I was still running 6:30 pace I thought I need to add just a little bit more effort and it helped (downhill mile helped also) – 6:14. Mile 4, 5 and 6 I started to realize that, though it is still early in the race, it’s not an easy effort for me – I had to really focus on keeping the pace and not to allow to get it sleep away too far (I remember at the start of mile 6 I kind of tried to relax a little bit after previous 6:22 mile and when I looked at my watch I was terrified to see I was averaging 7:16 pace – needless to say I added some efforts right there). I crossed 10K tracking mat at 40:04 (6:27 pace, 325th OA) – which was certainly on schedule – I remembered the rule – you run 20:00 5Ks all the way and it will bring you sub 2:50. I remember somewhere around mile 9-10 my average pace for the whole distance slowed down from 6:25 to 6:26 and I became really concerned – it was too early to start fading (even a little) . But not only that – the other thing I was worried about is the fact that I had to work relatively hard, so hard that I had some doubts about keeping that effort level for the rest of the race. My heart rate was creeping up little by little too and I was definitely not sure if it was going to be my day. I crossed half mark in 1:24:25, 6:27 pace, 295th OA – that was totally on pace for sub 2:50 with some small cushion. Starting around mile 10-11 I noticed I was running with two dudes that were suspiciously looking like my age dudes. And they looked really strong, we were constantly trading places – they would lead for a mile, then I would lead for a mile and it was not happening on purpose – that was just happening . I certainly didn’t think about any AG placement back there, but some competitive thoughts definitely crossed my mind not once – it’s one thing when a much younger runner passes you and another – when some older guy does that (keeping in mind that I thought I am not bad for my age) . But , I think, to my credit I was shaking those thoughts away – reminding to myself – I don’t want to get involved in that kind of competition and that my main goal is sub 2:50 – that is all I should be worried about. Just keep the pace to 6:25 average and that will serve you good. Turned out just that was enough to win that “battle” with those dudes . I am not sure what happened but around mile 16 or 17 something clicked – I still was able to keep to my average pace, but the effort definitely felt a tad easier, just a tad, but you know what that means at mile 17, right ? (and my HR shows going from avg 167 to 164, btw) I am still puzzled by that moment – I don’t think I ever experienced that before. Anyway, I think I started pulling away little by little from those guys. I crossed 20 mile mat in 2:08:56, 6:27 pace, 244th OA – still solidly on pace for sub 2:50 . Mile 20 – last rolling hills mile, after that it’s almost flat and it’s easier to keep the steady effort. 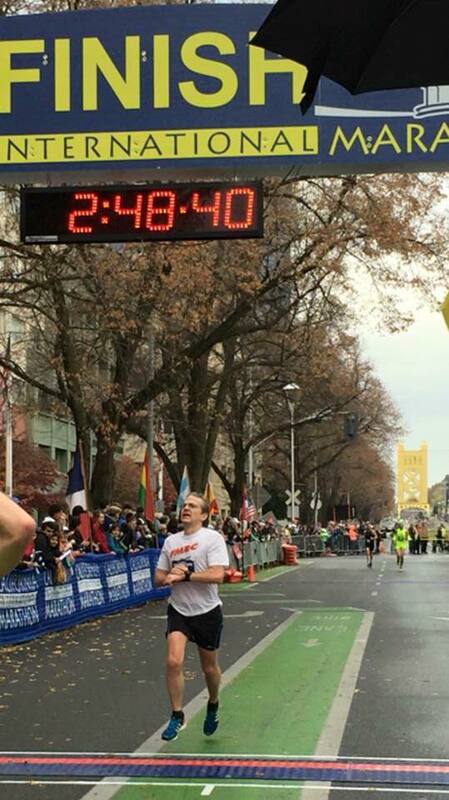 Probably right around mile 20, when we entered Sacramento, I thought that there is a big chance all is going to work for me today – if I only keep the pace steady or even fade a little bit (by then I knew I earned that “little fade” by running nicely for the previous 20 miles). But the thought it’s only 10K that I had to run gave me some additional motivation and I switched gears a little, adding some additional effort. Yes, I was hurting more but I knew that is going to end just if I continue doing that for some measly 10K . It was really encouraging to see 6:21 and 6:22 for the next two miles (miles 21 and 22!!!) and then 3 steady 6:25 miles plus the last mile (where my breathing was close to whistling – but not as awful as at CIM 2014 whistling). Part of the reason I was able to keep that pace – I was passing so many runners, and those were fast runners – it is so freaking awesome to experience that for your last 4-5 miles in a race like CIM! Last 0.2 miles – I just was super excited and gave my best. I saw the clock and it was at 2:48:3x something and of course I knew I did that and the thought that nobody will need to console me with – “not your day” and “you will do that next time” (which may sound totally offensive to a 50 year old guy like me ), thought of that filled me with such a joy! As soon as I crossed the finish line I was met by high five from kayry who was so sincerely happy for me – that was so emotional! Man, it is such a great feeling when you work hard but your work is not for nothing . Moose Mug – here I came! Nothing really interesting about post-race stuff. Good medal, warmer blanket, warm soup with great bread, non-alcoholic and alcoholic Erdinger beer. To organizers credit this year, they served alcoholic beer based on how you look (and if they had suspicions they would check your bib number with your age on it) , not asking for an ID – last year it was hilarious (but actually not) when even age on bib number was not a proof to get a beer. Good thing. I met my daughter who was surprised I looked good and was moving without issues (the area reminded battlefield with all the limping and wives helping their husbands runners) and I really felt great. Obvious soreness but nothing really worrisome or painful. We went to our hotel (it was one block away! ), they had late 1pm checkout for marathoners, I relaxed a little bit there, had a shower, uploaded my race data to Strava, read sub 2:50 and sub 3:20 forums for some feedback and inspiration from wonderful people there and was ready to drive home, happy and peaceful! High mileage really works. High mileage with quality really really works! That was first time in whole 5 years of my running hobby where I was above 340 miles per month for straight 4 months (I wonder if somebody says that it doesn’t work really well – because if some people run so many miles, they would run to be Olympic qualifiers and I only barely broke sub 2:50). Probably – Boston (I registered, but didn’t finally decided on that yet). If not Boston, then most probably Avenue of the Giants in early May. I am registering again for one of the Western States Qualifying races – either Miwok 100K or Quicksilver 100K. I am planning again to use 12 weeks training plan – either the same plan I used for this CIM or some form of Daniels – will see. For the remaining 6 weeks before the 12 weeks plan starts, I will try to run some short 200s, 400s, 800s and some fartleks – maybe wake up my fast twitch a little bit? Thanks for reading up to this point. No apologies for many words and letters – it is what it is .